Darren Aronofsky is the most underrated great director working in Hollywood today; he exists somewhere between David Cronenberg, Roman Polanski, David Lynch, and Luis Bunuel. He has crafted four masterpieces out of the seven films he’s directed, and even the other three have their own merits. All of Aronofsky’s films are about humanity and how fragile humanity is; most of the time, Aronofsky uses the human body as a symbol for his character’s humanity which is what makes his film so effective because the audience visually experiences the characters’ mental state. Some of the most visually grotesque body horror has come from Aronofsky’s films. Mother! has its fair share of body horror, but the real brilliance behind it has nothing to do with the use of body horror, and everything to do with the singular vision behind the film. Mother! has been dubbed the most controversial film of the decade for good reason: it is polarizing critics and most audience members hate the film. However, Mother! is the best film of the year for at least five reasons, but there are many more. For example, when was the last time a film garnered such a strong reaction from the audience and was as talked about as Mother! is? It has been awhile because film has lost some of its edge, but with Mother!, film has just gained some of it back; Mother! is a film blistering with ambition, and it conjures comparisons to European art house cinema in the golden years. Not since Lynch made his last film has surrealist cinema been this beautiful and worth celebrating. This is the kind of film that cinema needed and still needs because it is exciting, interesting, unpredictable, complex, ambitious, riveting, hilarious, horrifying, powerful, absorbing, mysterious, intense, deceptive, elusive, layered, awe-inspiring, polarizing, sophisticated, surreal, insightful, unforgettable, adventurous, daring, original, provocative, spellbinding, stimulating, visionary, and above all, the best film of the year, so here are the five reasons why. The trailer for a film is a very important tool for the filmmaker because it is the first encounter the audience has with a film, however, most filmmakers neglect this tool and fail to use it to their advantage; Stanley Kubrick edited his trailer for Dr. Strangelove in the style of an Arthur Lipsett film because he recognized the importance of trailers and just how vital they are to a film. Aronofsky recognizes this as well which is why he edited the trailer to make it look like a generic horror film because he wants to shock the audience and shatter their expectations; he pitched Rosemary’s Baby, but created The Exterminating Angel. This is completely brilliant because it adds to the shocking nature of the film. In the trailer, Aronofsky only shows a few scenes from the third act while making certain aspect of the film seem much more important than they actually are; on top of this, he mixes the order of the scenes up to such a degree that it seems like a completely different film than it is. Some scenes make it look like there is a love triangle between several characters, and the setting conjures memories of Days of Heaven which had a love triangle in the film. Plus, there is music in the trailer that is never used in the film. Again, all of this is Aronofsky manipulating the audience with expectations that never come to fruition; few filmmakers would attempt such a daring feat, and even fewer would succeed. The title of the film is just another part of the film people misinterpreted after they saw the trailer; they expected a film about motherhood, however, Mother! is referring to Mother Nature not motherhood. The posters for Mother! 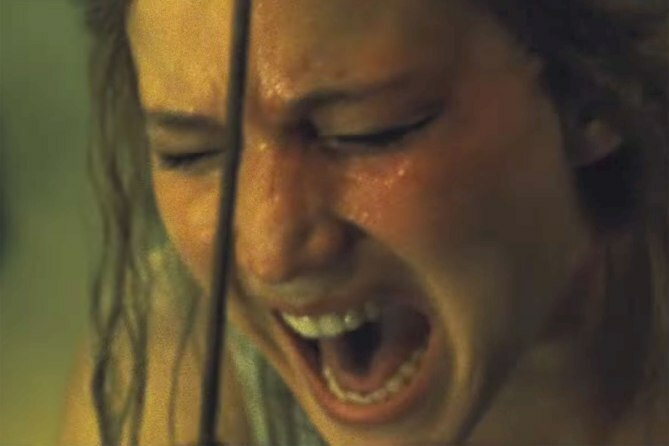 were the only indication of the film it actually was; Jennifer Lawrence had a cracked face that looked to be falling apart which would suggest the Lawrence and the house are on in the same (which they are in the film or rather they’re dependent upon each other). The fact that two of the three sources of information pointed in a different direction than the poster helped create an air of mystery around the film that doesn’t cease to exist even after you’ve seen the film. Haskell Wexler once said that “[cinematography] should integrate, serve, interest, and enhance the story”, and this is exactly what, long time Aronofsky collaborator, Matthew Libatique creates with his atmospheric cinematography. He shot Mother! on 16mm to create a feeling that is lost in either digital, 35mm, or 65mm; the feeling 16mm creates has more grittiness that is commonly unseen by audiences today unless we are talking about other Aronofsky films. This grittiness adds a level of both realism and movie magic to the film. Unlike most cinematographers who true to use the biggest and the best to create a spectacle, Libatique uses 16mm to convey to the audience that this is a more personal film than those other grand spectacles. Aronofsky has said he uses 16mm because he wants to give the audience a unique feeling that other films don’t have; however, this unique feeling he wants the audience to feel is one of personal attachment. So many of his films revolve around obsessed protagonist which is the audiences portal into the world Aronofsky is creating. More than half of Mother! is experienced in a close-up of Jennifer Lawrence’s face allowing the audience to sympathize with her much more than a normal protagonist. The audience experiences all of Mother! through Jennifer Lawrence; therefore, without the audience seeing her in close-up as often, the effect of the film wouldn’t be as intense. Another unique aspect of Mother!’s cinematography is the use of a singular location that takes place indoors, reminiscent of Edward Hopper’s paintings or Johannes Vermeer’s. Both painters seemed interested in the prison mankind has built for itself through its own structures which is commonly symbolized as a house or some other type of building; Mother! shows Jennifer Lawrence trapped within a the structure she built, and the cinematography captures the loneliness she feels within her own creation. She spends most of the film confused and unnoticed even though everything takes place within her house, and since the audience experiences the film through Jennifer Lawrence, they feel the same loneliness and pain that exists within the confines of both structure and creation. Aronofsky is one of the few film auteurs who understands the importance of sound design; Robert Bresson wrote in Notes on Cinematograph that sound is internalized by the audience, and no one uses this philosophy more than Aronofsky excluding David Lynch. Aronofsky’s sound design immerses you with the world; it creates an authentic feeling to his film that few films can match which is why his films are so effective. Mother! 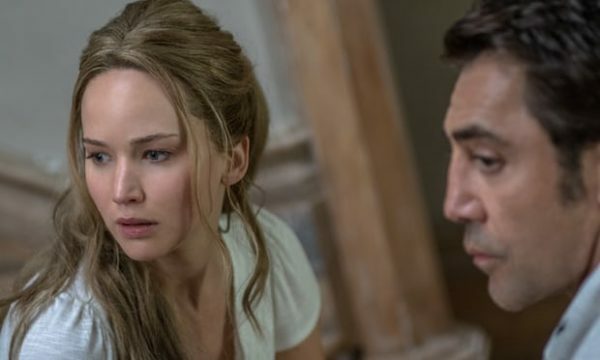 specifically uses the sound design to immerse the audience into the body of Jennifer Lawrence; they feel and experience the world of Mother! as Jennifer Lawrence or rather through her. The camera and sound design, as are many other aspects of this film, are working in unison. Part of the sound design is the choice to use no music; many great filmmakers, more specifically Ingmar Bergman, are known for using no music in their films which creates a deeper level of realism that is lost when using a score or a soundtrack. The lack of music increases both the amount of visual storytelling and storytelling through sound design; an example of this is near the end when the baby dies, and you can hear the brutality of the death (you can also hear the brutality of Lawrence getting beat up); however, in a normal film the music most likely would’ve been high notes and louder than the rest of the action to reiterate the horror you are seeing visual, but this isn’t effective in the least due to the over use of such methods in horror films. This death in Mother! has the same brutality of the curb stomping scene in American History X because in both scenes the sound design isolates a single sound that perfectly expresses the brutality of the murder. The sound design is the soundtrack for Mother! ; these sounds create a rhythm to the world as the audience experiences the film. The final act of Mother! includes so many sounds and different rhythms developing from these sounds that it feels intense like some sort of intense music is playing, but these are just the rhythms of chaos creating this intensity. Another thing that adds is directional sound that surrounds you as you experience this chaos. In other scenes before the final act, the rhythm of Mother! 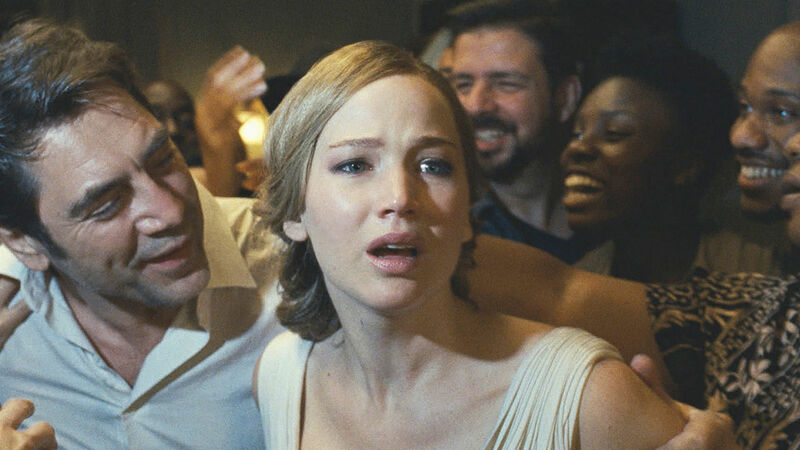 is less chaotic, but still just as immersive; one scene specifically makes it feels as if people are constantly behind you which creates the sense of paranoia that Jennifer Lawrence’s character is so obviously feeling throughout the scene and even throughout most of the film. The sound design is used to both create a world beyond the screen and immerse you into the world of Lawrence’s character. Mother!, on the surface, is a film tells the story a husband who neglects his wife because the attention of others is more important to him than the attention of his own wife which is illustrated in several scenes; for example, he spends the night with Ed Harris’ character instead of sleeping with his wife in the beginning of the film, and the film progressively gets worse from their with his neglect of her. Eventually, there is a period in the last act where you think he might be a good husband, but again he completely neglects his wife’s needs. The story told on the surface of Mother! also has to do with the obsession of the artist. In Jean Cocteau’s Orpheus, a similar theme is running through the film; Orpheus spends all day in a Rolls Royce listening to this special radio station because he wants to write down the poetry that is spoken on this radio station. In Mother!, Javier Bardem’s character spends all day with people talking and trying to get inspiration for his writing, and ironically, only find inspiration in his wife. This is the story most films would tell, however, Mother! is much deeper than just this surface story. The real story of Mother! 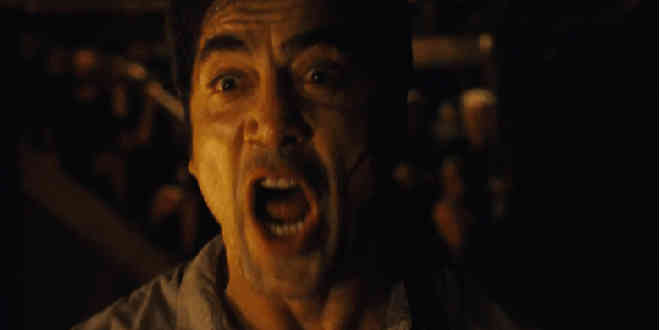 is a retelling of the Bible; Bardem is God and Lawrence is Mother Nature; the house is the world. This is extremely Bunuelian as Aronofsky has said himself which explain why he also has said the biggest influence on the Mother! is The Exterminating Angel; both films take the structure of society and watch them slowly crumble as incidents occur. Mother! is richer with allusions than most films (as it is a retelling of the Bible) which leads to a story beyond the screen; one that you take home a mull over for days, weeks, months, and years. This is the power of the type of allegorical storytelling Aronofsky uses in Mother! ; the questions pile up one after another because the implications of Mother! are powerful; for example, if Bardem is God, and we are all made in his image, are we all doomed to selfishness and obsession with our own cares? Aronofsky isn’t scared of provoking his audience and making them think which is seldom seen in contemporary film. The surface story is for the audience members who care about plot while the allegorical story is for those who love thought provoking cinema. Mother! would most likely be described as a horror film by most; it was marketed as a horror film, so that makes sense, however, Mother! is also a comedy. A comedy in the same way The Exterminating Angel is one as well; Bunuel loved creating scenes of absurdity that are both horrific and comical. This is easily seen during the final act of Mother! when the house slowly becomes a battlefield of both horrific and absurd proportions. At one point in the film, a whole swat team raid the house as a helicopter (possibly helicopters) flies over the top of the house; this film is beyond absurd, but so horrifically realistic that it creates a rare film that can make you both laugh and breathe heavily with fear. The film smothers every audience member with claustrophobic cinematography, realistic sound design, and events that can seem both horrifying and hilarious. For example, Kristen Wiig’s character goes from Bardem’s editor to an executioner in a matter of minutes which is terrifying at first when you see someone’s brains get blown out, but hilarious once you realize that it is Wiig’s character who is killing people. There are other scenes like this where absurdity seeps out of every scene; in another scene, Lawrence is running around the house trying to protect it, which is intense, when she sees these people randomly painting her house. Without the random painters, the film would’ve been a generic thriller/horror film; the comedy adds a timelessness to Mother! That allows it to stand up to repeat viewings. It has at least four different layers and many more that are impossible to completely comprehend. The beauty of Mother! is the amount of interpretations it yields which is due to this duality of horror and comedy in the film. The audience is never fully aware of the intent behind each action creating a film that is completely unpredictable even though the ending is setup from the beginning; it is impossible to see the bigger picture, and even after a single viewing it is hard to see the big picture and take the film as a whole. Everything carries a duality which create many interpretations because of the different way it affects people; someone might find the ending cheesy and funny while others might cry , and both reactions would be completely appropriate because the ending is silly, but it also illustrates the true selfishness of Bardem’s character. Mother! is a film of the old cinema: the cinema that is lost in today’s society. It is everything a great film is and needs to be. Aronofsky crafted a film that polarizes the audience, so they can fight about the film in the theater, or anywhere someone has an opinion; most great films elicit strong reactions. For example, Orson Welles called Vertigo the worst Alfred Hitchcock film he had ever seen, and in 2012, Vertigo was voted as the greatest film of all time just surpassing Welles’ own film Citizen Kane in BFI’s famed poll taken every decade. Therefore, it is reasonably to assume that all of these polarized reactions to Mother! are undoubtedly due to the fact it was something different than expected, and something extremely complex while being completely visceral; few films have pulled off such a feat. Mother! is a film that comes around rarely; it is filled with ambition and the skill to pull it off. Mother! is a masterpiece.